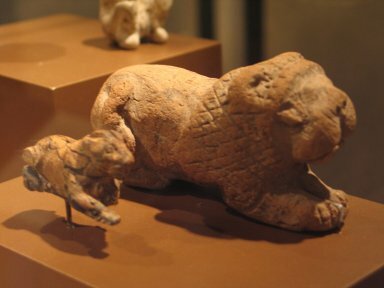 Light brown terracotta statuette of a lion with a minimum of detail in modeling; couchant position with four legs pointing forward. Eyes barely indicated; thick mane cross-hatched with incised lines. Tail curved over right haunch. Testicles indicated. Condition: Perfect, except for small scratches on body.